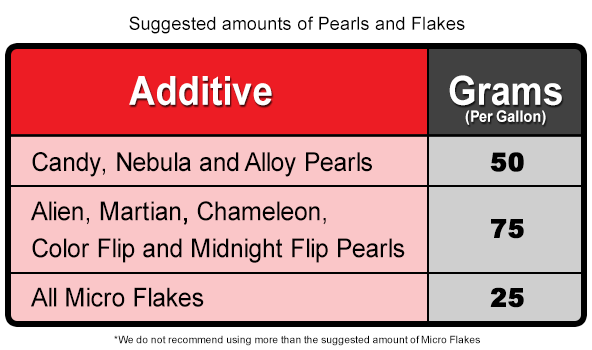 What Spray Gun are you using when applying these additives? How much pearl do I add per gallon of Plasti Dip Spray? - For best results we suggest mixing in 50 grams per gallon, but up to 75 grams can be added. - For best results we suggest mixing the pearl directly into either clear Plasti Dip Spray, or a 50/50 mix of Plasti Dip Spray and Glossifier. However, pearls can certainly be added directly into colored Plasti Dip Spray for unique colors and effects. Play around to see what you like best! Are you using Thinned or Un-thinned Plasi Dip when adding pearls? How much Micro flake do I add per gallon? - For best results we suggest mixing 25 grams per gallon. You can use up to 50 grams per gallon but the surface will have a slightly sandy texture. Can I use Micro Flake like Pearl to make custom colors? - Yes you can, but if you add the required 50 grams per gallon you may end up with a Sandy textured surface when finished. Do I have to apply a base coat first? - Yes, base coats are required for all Dip Pearls. For many of our examples we use a Matte Black Plasti Dip Spray base coat, however, you may use a Color Matching base coat if desired (Blue Plasti Dip Spray as a base for World Rally Blue Pearls for example). Experimenting with different base coats and top coats is encouraged - we are creating new and exciting combinations all the time!